Shostakovich’s Chamber Symphony, Op. 110a, arranged for a chamber string orchestra, turned from superbly synced somberness and dark brooding to fully and totally fiery moments. Speedy movements thrilled, slow ones chilled. In the Allegretto, the composer’s D-S-C-H signature came with sureness of shape. In the following Largo, Sphinx inexorably delivered the three-stroke rhythm made at the frog of the bow. For me, one very much interested in our world of music, Sphinx Virtuosi’s program title “Music without Borders” set up a possible contradiction, or maybe something of a double entendre. Sphinx did travel well beyond the Bach-Beethoven-Brahms borders. But what would we do with no borders at all? Gaspar Cassadó’s Intermezzo e Danza Finale from “Solo Cello Suite” would not have had its Catalan flavor, its Phrygian modality, or its flings with Flamenco. Eighteen-year-old cellist Sterling Elliott amazingly brought all those flavors and modalities home. His rendering of the Cassadó pointed to magnificence from idiomatic cello writing. The young cellist cast tonal accents and rhythmic inflections in his own already accomplished virtuosic and poetic ways. Dabke from “A Voice Exclaiming” by Kareem Roustom maintained strong links with Syrian music. Born in Damascus, Roustom and his family moved to Massachusetts when he was 13. We learn that he plays the oud, the Arab lute, and his piece was named for a kind of Arab dance. The opening section and its return for the closing section lifted into Syrian spheres eloquently and excitingly. Hitting on all cylinders as it did throughout the Sunday afternoon program, here, Sphinx electrifyingly promoted a Syrian expression and more. Yasushi Akutagawa’s “Triptyque for String Orchestra” was in a kind of disguise as far as borders go. The Japanese composer rarely showed signs of his country’s voice. Sphinx opened with this work instantly putting listeners on alert—dynamism’s a trademark of theirs. Soloists Annelle Gregory and Thomas Mesa winningly called and answered each other before continuing on in a dialogue between violin and cello in “Dance for a New Day” by Terence Blanchard. The piece wandered, where was it going? I missed the dance and a new day. Despite Blanchard’s predilection for an exotic sounding scale, which he seems to have become mired in, Sphinx covered the piece’s shifting textures with exceeding precision. Miguel del Águila’s “Life Is a Dream” (La vida es sueño) and Bernstein’s “America” from West Side Story fell deeper into the Latino shadows. In addition, Águila adopted speaking and whispering. An arrangement of the Bernstein called on the instrumentalists to become something of a banda de percusión. In the overall programming, timbre-drenching loomed with the many pizzicatos, tremolo-like actions, and various bowings drawn from the fingerboard to the bridge. 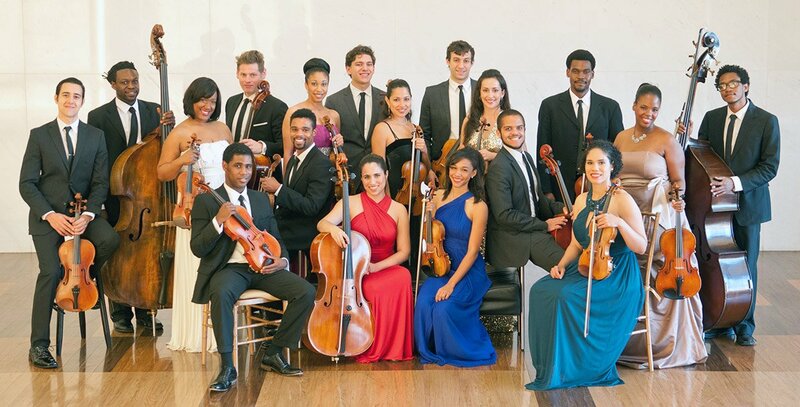 Each fall, these virtuosi come together as cultural ambassadors to reach new audiences through their national tours. Catch their dynamism and freshness if you can.